The 2018 interest payments were distributed in the Autumn. Bonds are no longer being issued. 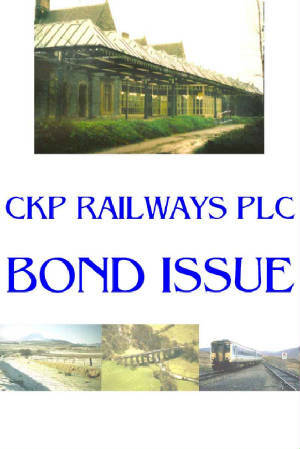 CKP Railways plc Bonds are not traded on any exchanges or markets. Around £ 400,000 raised from sales of Bonds paid for the survey and design package completed in the early 2000s. The outline Business Case followed in 2007. Work since then has focussed on creating the right local political climate to allow the Railway to be built. 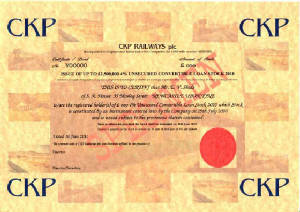 Bond Certificates are printed in full colour, A4 size, on a heavy parchment-style paper. Several Bondholders have framed their Certificates and put them on display to encourage others to subscribe ! New Bonds are currently not being issued. You could subscribe to Updates, buy books, videos, etc. via our Sales Items page.